Rich Kyanka stories at Techdirt. 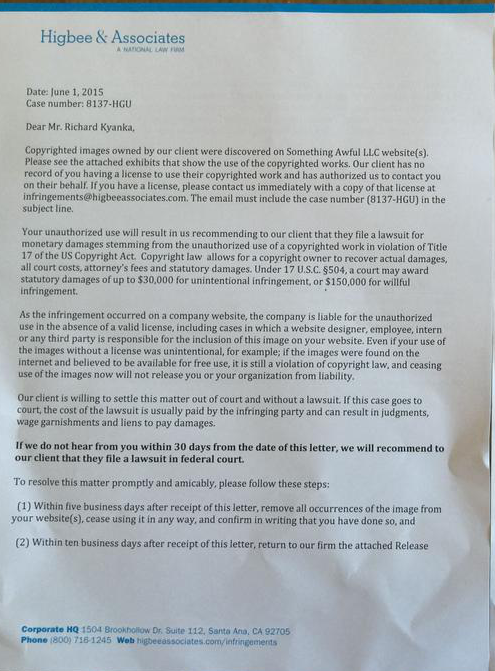 stories filed under: "rich kyanka"
Rich "Lowtax" Kyanka is certainly no stranger to ridiculous and misguided legal threat letters -- and it appears that he's now got another one. 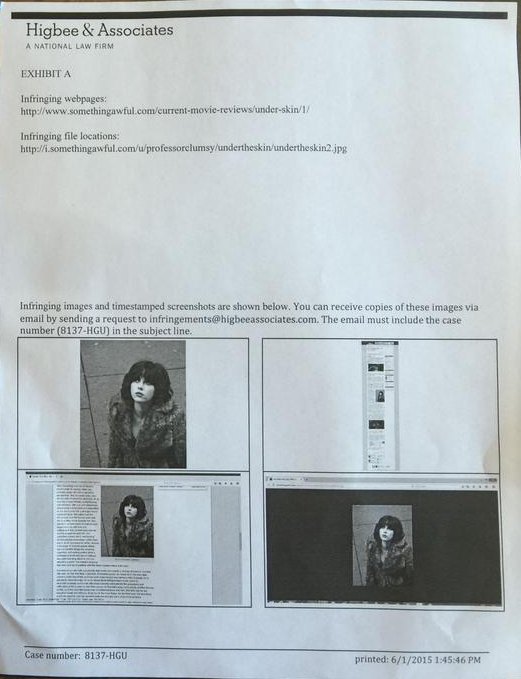 On Monday, he posted to Twitter an image of a threat letter from law firm Higbee & Associates, claiming that this April 2014 review of the Scarlett Johansson film Under the Skin is infringing on Higbee & Associate's "client's" copyright because it includes a still image from the film. Here's a screenshot of the image in the page with the review: The review itself is fairly positive on the movie. And, if you're wondering, that same exact image was used on tons of reviews. Like this one and this one and this one and this one, and I'm getting tired cutting and pasting, but trust me, there are plenty more. As the infringement occurred on a company website, the company is liable for the unauthorized use in the absence of a valid license, including cases in which a website designer, employee, intern or any third party is responsible for the inclusion of this image on your website. That, of course, completely ignores the DMCA's safe harbors which actually say the opposite: that a service provider can be protected from liability from actions of third parties, under some specific circumstances (which may or may not apply here -- but it does seem odd that the Higbee lawyer seems to not even understand this). 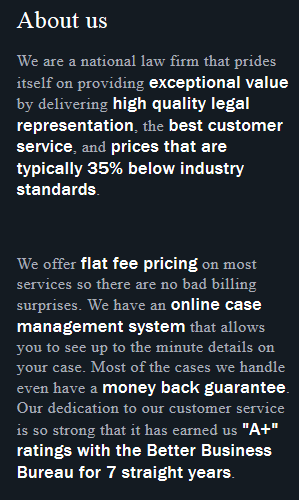 We are a national law firm that prides itself on providing exceptional value by delivering high quality legal representation, the best customer service, and prices that are typically 35% below industry standards. We offer flat fee pricing on most services so there are no bad billing surprises. We have an online case management system that allows you to see up to the minute details on your case. Most of the cases we handle even have a money back guarantee. Our dedication to our customer service is so strong that it has earned us "A+" ratings with the Better Business Bureau for 7 straight years. It seems likely that the unnamed "client" here is INFPhotos, which is a stock image provider of celebrity photos. Some of the other stories that have used the same image cite INFPhotos, so chances are that's who's licensing the photo. Given all that, perhaps there's some sort of legitimate claim buried deep behind the weird threat letter, if the image is not actually from the movie itself, but from a separate photographer. Even so, it seems like a bizarre reason to go after SomethingAwful, and one that's not likely to end up going particularly well for Higbee & Associates.